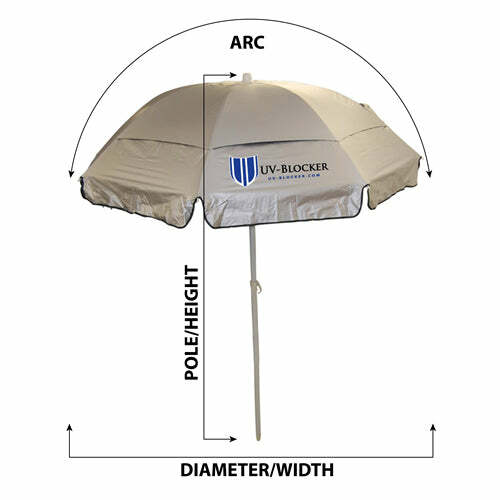 Our NEW UV-Blocker Large 7 1/2 foot Beach umbrella is ESSENTIAL for beach-loving melanoma fighters! Its sleek, patented, and large design will protect you and a loved one from sun damage (UPF 55+), wind, and heat. Enjoy the sand and surf in safety and comfort with your portable beach umbrella! We have increased the strength and durability of the fiberglass ribs while maintaining our #1 Patented Vented Mesh System. This design lets the wind pass between the upper and lower canopies. Our UV-Blocker umbrellas remain very stable in high winds, thus preventing inversion and making this a windproof umbrella. Yet it is still light enough to carry over your shoulder to the beach. Now with 24" heavy duty metal anchor for the added stability, can be used in the sand or dirt. No more racing after a flying beach umbrella from a windy day at the beach. This UV Protection Large Beach Umbrella Kit is in stock and ready to ship next business day. This UV-Blocker UV Protection Large Beach Umbrella has been approved by the Melanoma International Foundation to help protect you from the harmful UV rays. We go to the beach a lot. We use 2 umbrellas and the UV-Blockers blocks a lot more sun than the others. We had a 7' one until the shaft broke on it. We contacted UV-Blocker with the problem, but they had stopped making the one we had so they sent us a 6'one. While that was great you can't stretch out under a 6' umbrella so, I fixed the 7' one and still use it today. When they came out with this one I didn't hesitate to buy one. The low profile and vent does great in the wind, and the shaft on this one is super strong. You do have to anchor it well, because it is a big umbrella. I love this brand of umbrella's; this 7.5ft umbrella is great, but it is really tall and I cannot adjust the hight. There are three settings as far as the circumference of the umbrella, but if the sun is low, the umbrella is useless because I cannot adjust the hight. I do love how light this one is, and sturdy, plus the carrier is much better quality than the last model I had. It definitely keeps us cool at costal and inland soccer games. I have owned a few of these umbrellas and use them weekly at the beach. They will not collapse on you in heavy winds and are made very well. They will lasts you at least 3 seasons depending on use. I would not buy any other umbrella! Does not live up to claims. I have owned this umbrella for two or three years now and yesterday, a moderate bit of wind severed the metal shaft clean off right at at the point where one adjusts the angle of the umbrella. Also, the wind will turn this umbrella inside out. So, the quality of the metal at that critical angle point on the shaft is as cheap as it can be and still be called metal plus the engineering of the frame for the umbrella itself does not prevent from turning inside out. The first time i used the umbrella was on a windy day and it went inside out and i closed it and was not able to use it. I noticed there were other brands of umbellas around me that were in use that seemed to withstand the stronger gusts. Aside from that, the quality seems good, but the wind problem needs to be addressed and fixed.